Lovers of luxury camping who want to explore the Ardeche region of France will find that booking at Val de Cantobre Campsite is the perfect option. This leading LUX-camp also offers a good range of other types of accommodation options to choose from such as mobile homes and guests will be able to enjoy an excellent range of onsite amenities in between exploring the surrounding area. What Makes Camping Val de Cantobre Campsite So Special? This luxury camping site comes complete with an impressive water park, which is the perfect place to cool down on a sunny day and have fun. The whole family will be able to have fun in this large outdoor aquatic area, which in addition to a stunning swimming pool boasts a threefold waterslide, two paddling pools for younger children to enjoy and a log flume for thrill seekers. Guided walks of the surrounding area are provided by the staff at Val de Cantobre Campsite to make sure that guests enjoy every moment of their camping holiday. Guided tours are provided in English and guests will be able to get a feel for the area as they follow hiking and walking trails through the countryside. Those guests who have a strong sense of adventure will be able to try their hands at rock climbing, abseiling and a wide range of other types of activities. Anyone who prefers exploring independently will also find a wide range of exciting daytrip destinations right on their doorstep. 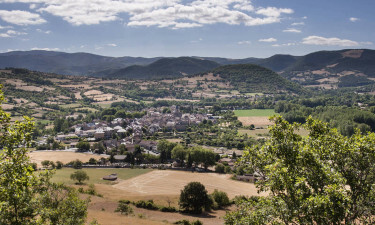 The charming town of Nant is just a few miles away and the 11th century church is just waiting to be explored along with the old market, while several cool caves and other attractions can either be reached on foot or by hiring a bicycle from the staff at Val de Cantobre Campsite and heading into the countryside. Whether you want to sample traditional French cuisine or are hungry for a taste of home, you will find plenty to get your taste buds tingling at Val de Cantobre Campsite’s excellent restaurant. This part of France is famous for producing Roquefort cheese, which makes the perfect treat to enjoy at the end of a meal alongside a glass or two of locally produced wine. Evening entertainment is also provided and there is something for the whole family to enjoy here. When it goes to buying supplies to put together a picnic or cook a meal for the family, guests never need to venture far as a small supermarket can be found right on the site. 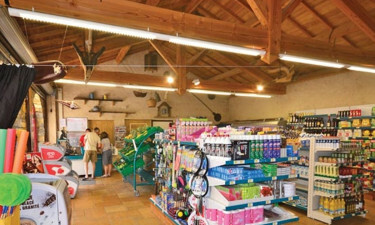 This shop is stocked with produce that is grown right on the farm itself as well as a wide range of goodies that come from the area, including the signature Roquefort cheese.